Brandon Browner played three seasons in Seattle. Cornerback Brandon Browner was reinstated by the NFL after serving an indefinite suspension for violating the league’s substance abuse policy. Browner, who is set to become a free agent on March 11, must serve a four-game suspension to open the 2014 season, the NFL and NFLPA said in a joint statement. “The NFL and NFL Players Association have agreed to conditionally reinstate Brandon Browner from his indefinite suspension under the Policy and Program on Substances of Abuse,” the joint statement reads. “Browner was suspended without pay for the Seattle Seahawks’ final five games of the 2013 season, including the playoffs. 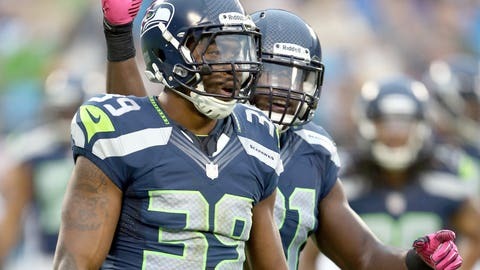 His contract with the Seahawks expires at the end of the 2013 League Year on March 11. Whoever signs the 6-foot-4, 220-pound cornerback will get a physical cornerback, who excels in press-man coverage. "I received wonderful news today," Browner said on his verified Twitter account Tuesday. "The NFL has reinstated me, and I now have the opportunity to prove to the fans and my teammates how important this sport is to me." Browner missed out on the Seahawks’ run to the Super Bowl, but is fortunate as he’ll be able sign with a team and attend offseason activities.